Great Britain's Olympic silver medallist Todd Bennett has died at the age of 51 after battling cancer. 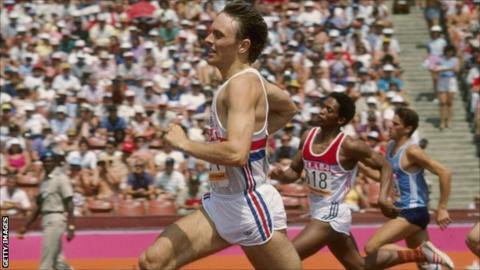 Bennett, who was born in Southampton, won a silver medal in the 4x400m relay at the 1984 Olympic Games in Los Angeles along with Kriss Akabusi, Garry Cook and Philip Brown. He was also a former world indoor 400m record holder, running 45.46 seconds. Bennett was European Indoor Champion in 1985 and 1987, and also won silver at the World Indoor Championships in 1985. Former European and Commonwealth 400m gold medallist Iwan Thomas trained with Bennett at Team Southampton AC and paid tribute him. "It's just so sad really," Thomas told BBC Radio Solent. "We all knew Todd was unwell and it all happened so quickly. "I have lovely memories of him. When I first moved to Southampton I trained with him and then he subsequently became a really good coach. "He was someone I looked up to, always gave his all and would never be shy to give any advice. "He was a really nice guy and my heart goes out to his family. "What an amazing athlete, a real gutsy runner and one of those people who was so proud to put the GB vest on. I will remember him as a kind man who gave up his time for others and as an athlete someone I really respected." Bennett's son Aaron paid tribute to his father on Twitter: "Today Todd Bennett crossed his final finish line.. Cancer one of the few to beat him. Went out battling. Best father to wish for #sleeptight." And his business partner and close friend Darren Campbell, who won Olympic relay gold in 2004, added: "Thank you Todd Bennett for allowing me to know a special man, father, husband, athlete and friend. You will always be in my heart! #RIP."